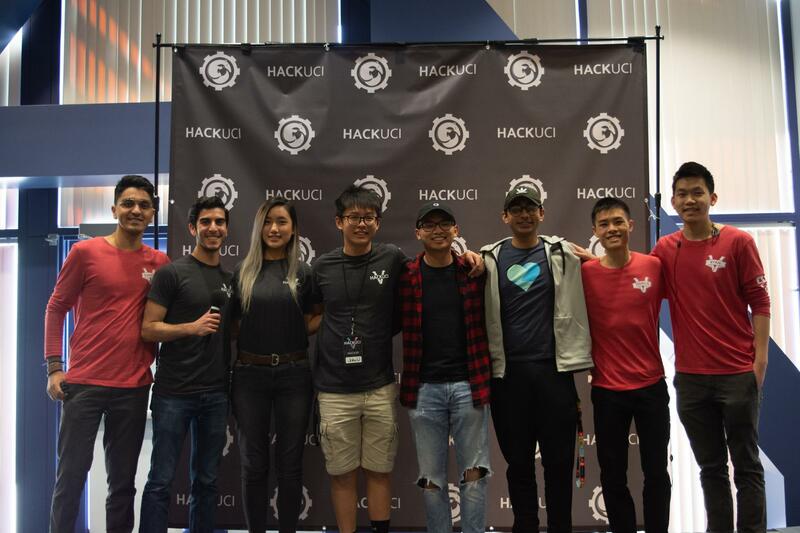 Now in its fifth year, HackUCI offers students 36 hours of coding in a fun and collaborative environment. 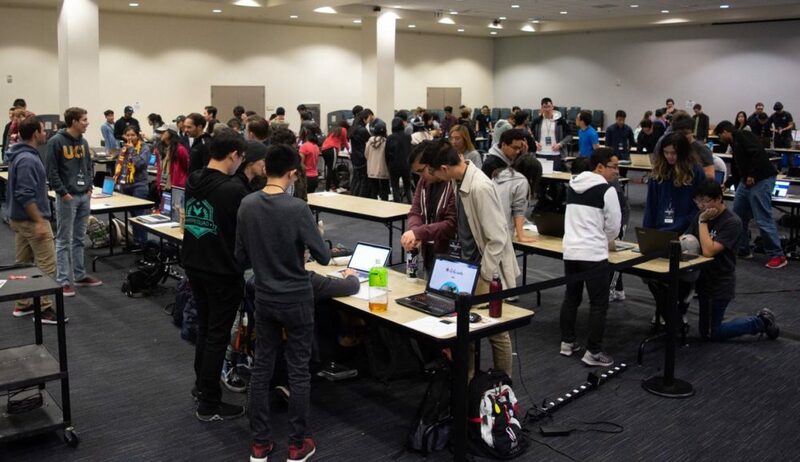 More than 400 undergraduate and graduate students attended this year’s hackathon, held in the UCI Student Center the weekend of Feb. 15. The event was a huge success, with $5,410 in prizes and participants creating 76 new hacks, ranging from useful websites and novel safety devices to creative augmented reality apps and entertaining and educational games. The award for Best Overall Hack went to Listen, a website that lets you search audio files just as you would a text document, creating a “command-F” option to find the exact timestamps for a certain word or phrase. The Hacker’s Choice and Best UI and UX awards went to Emocean, a website that can track and analyze the mood of users watching a video. This application could help businesses gauge reactions to promotional videos, for example. Team members for Emocean, which received the Hacker’s Choice and Best UI and UX awards. The augmented reality app mARk, which lets users create and share digital art, won the Most Polished award, while Drive Alert, which detects and alerts drowsy drivers, was recognized for its Best Use of Embedded Systems. Peter Spell Master, a game that teaches children new vocabulary words, won Best Education-Focused Hack. To learn more about all of the projects developed, including additional award-winning hacks — such as the Best Joke Hack and Best Entrepreneurial Hack — see the complete list of 2019 submissions. First-year attendee Ben Smith agrees, saying that at HackUCI, you have “a plethora of resources [at] your disposal.” There were more than 70 mentors and volunteers on hand, and throughout the event, there were software development workshops focused on everything from iOS to web development to VR/AR. There were also technology talks with industry professionals from companies such as GitHub, and discussions about emerging technology, including a Blockchain at UCI presentation. “The weekend provided numerous free workshops for us to learn more about technologies we were using or are interested in using in the future,” says Smith, “and it gave us a platform to commit to building a project that we can put in our portfolios.” Smith’s portfolio now includes Look & Cook, an iOS application that prioritizes recipes based on ingredients you already have. This article originally appeared in UCI: In The News, March 11, 2019 and is re-posted with permission in the UC IT Blog.